A company picnic and an issue due for release have brought me into closer contact than usual with work colleagues over the past two weeks. And that has me thinking about a topic I addressed on the old Readers Forum of our website a number of years ago. Technology has made it possible for me, like people in many other businesses, to work primarily from a remote location rather than in the office. This is a wonderful advance, but with so many businesses now encouraging, or even requiring, work-at-home time, it seems to me that the office as a setting for the murder mystery may be on its way out. I once read an article intended for aspiring mystery writers that identified the office as the perfect environment for a “cozy.” And it’s true, for an office provides a closed circle of suspects, all of whom know each other and likely have built up a grievance with at least one other person on staff. Often a place of rivalries, jealousies, and sexual attractions (I’m not talking about our office, of course! ), the workplace provides just the kind of potentially deadly mix of passions that could lead to murder. It’s also an ideal place for a Poirot-style detective to exercise his skills in observation and deduction on a limited group of potential killers. But all of this presupposes the pressure cooker of daily interaction. Send people home to work two or three days a week and it’s like loosening the valve on the cooker. No malice, no murder. One of the classic sources of strife in the workplace used to be the “window office,” or, at higher, corporate levels, “the corner office”—the ultimate symbol of status and power. Nowadays—when there’s hardly anyone around to impress—who cares? Today’s office-space conflict is more likely to turn on who gets a seat at one of the limited number of desks available in the pared-down space on any given day of the week. And that usually generates minor squabbles at most; it’s not something people get into a lather about. Speaking for myself, I’m too glad to see my colleagues on the few occasions I’m in the office with them these days to care about space issues. I suspect that a few years from now, many businesses won’t have offices at all, and for magazines such as ours that could present some serious difficulties. For one thing, what would happen to the archives, files, and memorabilia of decades? 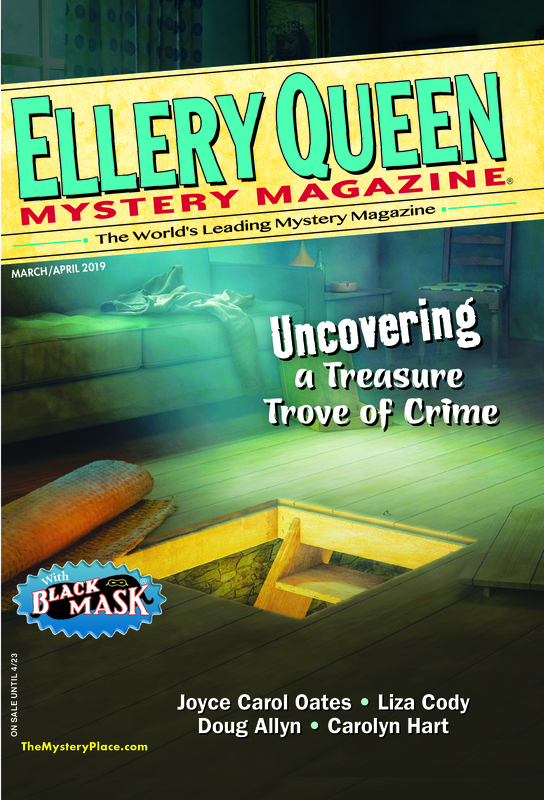 I count it as one of the downsides of the work-at-home arrangements of earlier decades that neither the files nor copies of the files of either of the magazine’s previous editors, Frederic Dannay and Eleanor Sullivan, are housed with EQMM. In the former case, most of these papers were preserved and are now housed at Columbia University along with Dannay’s other papers. In the case of Editor Sullivan, however, they have simply been lost or destroyed. Virtually nothing remains. Both Dannay and Sullivan worked at home in an era when such arrangements were rare, but most of the magazine’s support staff at the time worked from the office, and since most author correspondence traveled through the office on its way to the editors, we have author files going back decades. I’d be sorry to lose access to them were we ever to transition entirely to home offices or to a virtual office. I don’t know whether there’s a bit of nostalgia in my feeling this way, but I also worry about what the lack of a common daily work space may mean for young people coming into a business such as publishing. For all that a workplace can be a cauldron of simmering tensions (and I vividly recall voices raised periodically in shouted argument at my first job—a setting for a murder mystery indeed! ), it is also a place where the fast friendships of decades are formed, and where a great deal of learning can occur simply by osmosis. Can as much be absorbed through electronic communication? I guess we’ll find out in the years to come. And no doubt new motives for fictional murder will arise in the wake of these new arrangements too. Maybe virtual office arrangements, many of which are already bringing people from different types of businesses together in transitory shared physical workspaces, will even give the workplace mystery a new twist. Let’s hope so. Mark Lagasse, Ché Ryback, Jackie Sherbow. Photo by Janet Hutchings.